Running a Capital Campaign requires a complex blend of skills. These include resources: marketing, messaging, material production, personal cultivation, and process management just to start! In this era of YouTube video instructions and tutorials on the internet, beginning could be confusing – especially with a sophisticated program like Fundraising. First, running a Capital Campaign “in house” remains a risky move — even when staff or executives have experience raising large amounts. In fact, we find that our smartest nonprofit leaders know when to seek wise counsel from the outside. Especially when it allows an organization to break long-standing bottlenecks and accelerate progress to meet their goals. Our approach seeks to learn as much as we can about your unique mission, people, and location. Then we can integrate our best practices with your strengths, providing solutions to fill whatever gaps appear in the process. Your company then obtains the best of both worlds: staff and volunteers are fully supported in their leadership, and the Carlton & Company’s tailored framework saves valuable time and money putting a process in place from scratch. Chances are good that within your organization your employees are working more than 40 hours each week in order for your organization to serve the community. Now imagine adding an additional full-time job with expertise that is very hard to find – requiring another 40 hours per week. That’s what Capital Campaign Management is: a full-time job. Running a Capital Campaign includes a variety of jobs and expertise that are typically not available at a nonprofit. 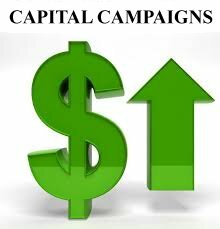 Let us show you how to run a Capital Campaign successfully. These skills require the focus of an employee who knows what he or she is doing in the fundraising arena. Guide the process to achieve established goals: Setting a public goal that is achievable is one of the first priorities. Knowing how to achieve that goal requires expertise that Carlton & Company possesses. A feasibility study will provide the data needed to set achievable goals. Recruit and train volunteers to work with professional fundraisers: Our capital campaign model is built on the knowledge that donors are more likely to give, and give more, when they are asked for a gift in person. That means that volunteer recruitment and training is critical to the success of major fundraising efforts. A capital campaign consultant will do the bulk of this work. Develop and implement communication strategy: Your organization has a great story. One that will inspire donors to give. Don’t let your message – or the lack of one – get in the way of fundraising success. Professional campaign managers know how to shape the narrative to sell your organization to prospective donors. Maintain a timeline customized to the organizations Capital Campaign strategy: It can be easy to lose track of time. And that can be a killer mistake for a capital campaign. Campaign managers focus on one project at a time and devote their work week to the effort. This allows for a smooth, well-coordinated campaign. We will provide 24/7 Capital Campaign Management support, including as much time on site as needed to ensure your Team that the Capital Campaign will meet its goals, and strengthens the organization for years to come.